"Minotaur, why are we on a hill in the middle of nowhere?" "Read that note I gave you again." "It says, "Stop asking stupid questions." But I never ask stupid questions!" "This morning you asked me who the first ever person to fold towels was!" "From battling giants, to outwitting gods, to clashes with mythical creatures, Ancient History has never been more fun! 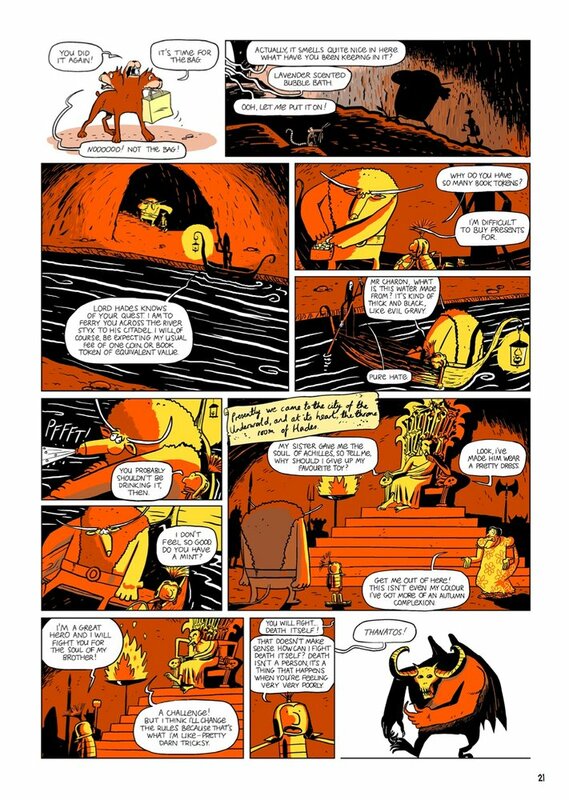 An Asterix for the 21st Century, Useleus is skilfully written by Alexander Matthews and nimbly drawn by Wilbur Dawbarn. 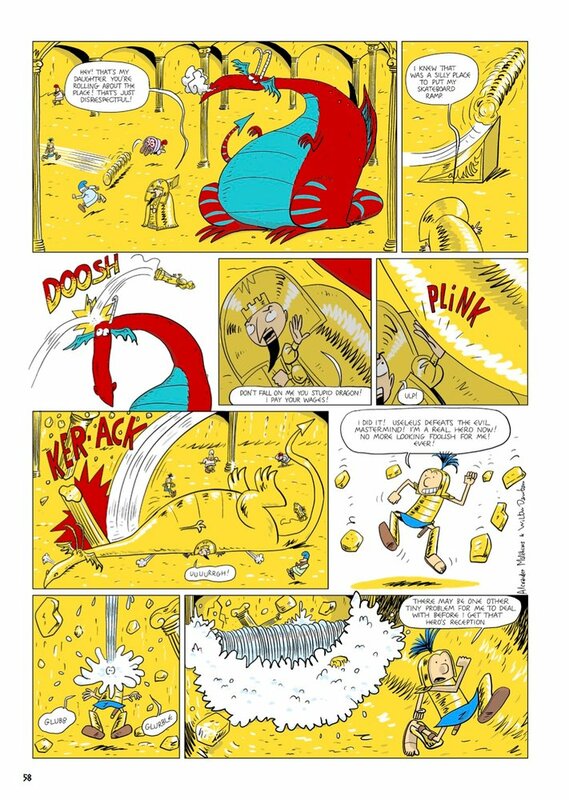 Leaping from the hallowed pages of popular children's weekly comic, The Phoenix, USELEUS channels Ancient History through the madcap eyes of two renowned Beano and Dandy creators, Alex Matthews and Wilbur Dawbarn." 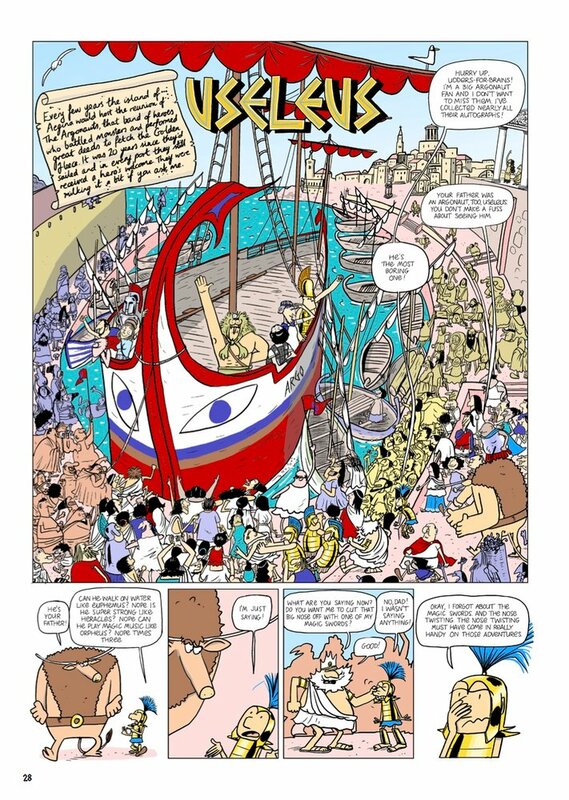 Haha, I think Useleus' mental capacities are much more in line with Sergio Aragones' GROO as Asterix always had a bit of crafty smarts to go with his moustache and muscles, but poor old Useleus is the veritable empty gourd, all sound and no substance. 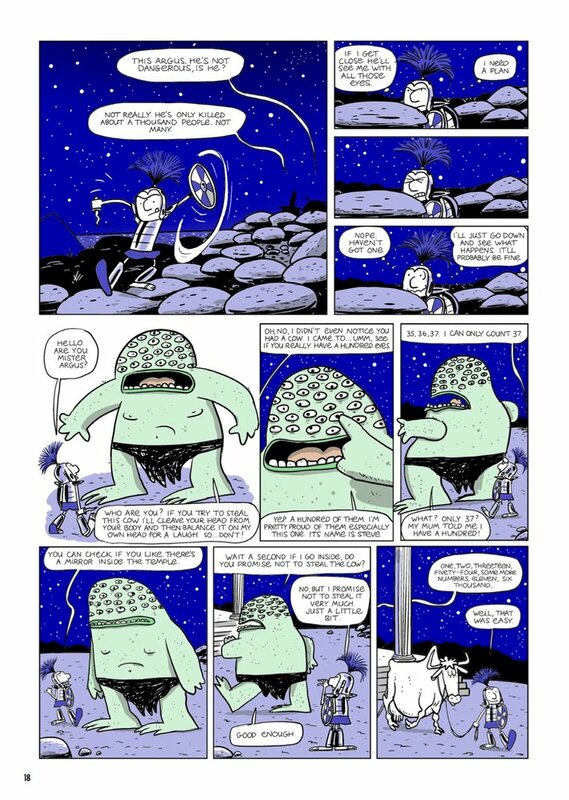 Fortunately for him, though, much like Groo has his loyal canine companion Rufferto to patiently steer him in the right direction, or at least save him from total catastrophe, Useleus has the mighty Minotaur, now retired from labyrinth lurking and having taken on the mantle of teacher to his dimwit charge. All the Grecian errr... classics of classics are here to confound, confuse and repeatedly marmalise our 'hero'. We've got monsters aplenty including the three-headed Chimera and the riddling Sphinx, gallant legends such as Icarus and Achilles, plus vengeful gods such as Hera, Hades and the ever uppity, cantankerous granddaddy / daddy / brother of them all Zeus. 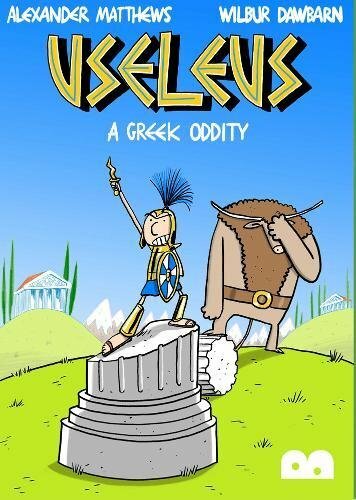 Even a passing knowledge of Greek history will ensure you know most of the set ups, including one involving a certain giant wooden horse... Watch Useleus blunder his way through adventure after adventure and somehow make it out alive, if never actually unscathed. He's a tough cookie, I'll give him that. Fans of previous Bog Eyed Book publications such as Gary Northfield's THE TERRIBLE TALES OF THE TEENYTINYSAURS and DEREK THE SHEEP plus DEREK THE SHEEP: FIRST SHEEP IN SPACE will undoubtedly love the level of utterly ridiculous and indeed the frenetic, frolicking art style. This is stoopid done right! If for some reason, though, you're more of a consequential cove and take a rather more highbrow approach to your ancient sequential scroll-based learnin' please do check out Gareth Hinds THE ODYSSEY and THE ILLIAD, which despite being at the absolute other end of the sensible spectrum is just as superb in its own rather, well considerably more, serious right.